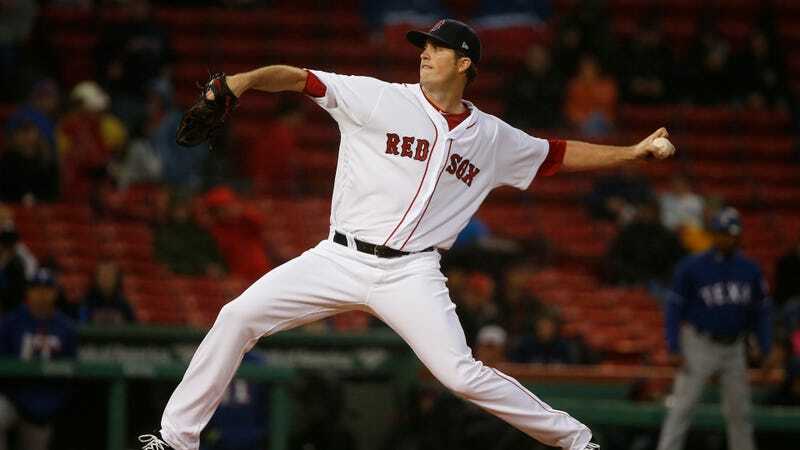 Behind perhaps the least marquee starter in their rotation in Drew Pomeranz, the Red Sox struck out 20 batters tonight to tie a major-league record. Pomeranz tied his career high with 11 Ks in six innings against the Rangers—the first time in his last five starts that he’s lasted so far into a game. The Red Sox got out to a 4-2 lead behind him, and the bullpen then kept things going in similar fashion. After two strikeouts by Heath Hembree, one by Robby Scott and two by Matt Barnes, Boston went into the ninth inning with 16 strikeouts. It took a little bit of weirdness for closer Craig Kimbrel to record four Ks and the team to tie the record. Kimbrel had the first batter of the inning, Nomar Mazara, in a 2-2 count when the right fielder swung big and missed—at a pitch that hit his foot. Mazara went to first, but after a replay review, Kimbrel was awarded the strikeout. He went on to strike out the next three batters to close out the victory and put Boston’s pitching staff in the record books. Not quite as nifty as doing it by yourself at 20 years old, but pretty fun all the same. David Ortiz Calls Out Bobby Valentine In New Book: "Aggravating As Hell, Arrogant And Disrespectful"